Holy crap folks, the always epic Stone Brewing Company knocked it out of the park with this easy drinking bad boy. 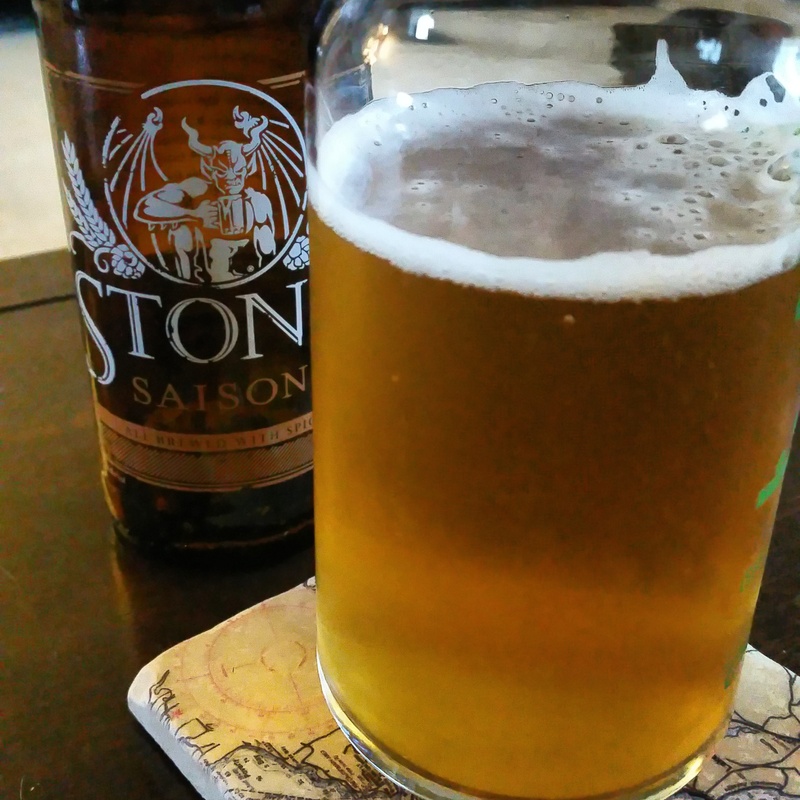 Stone Saison is a modern reinvention of a Belgian classic. Brewed it it’s original form to slake the thirst of hard-working Belgian farmhands, the saison is meant to be flavorful and refreshing without being heavy. The literal definition of a farmhouse ale, the saison (or “season” in French) used to be brewed during the fall and winter and saved for consumption during the hot summer months. The ale was known to be spicy and flavorful as a result of the infusion of hops, fruits and other spices, though flavors (like recipes) varied widely from farm to farm. By some accounts, farm hands were allotted up to five liters of the brew per day, and while that sounds like an excessive amount (five liters is roughly equal to just over ten pints) most traditional saisons clocked in at roughly 3% ABV. Thankfully, Stone has opted for a more modern approach. Given that their intention is not to motivate 18th century field laborers, but to provide delicious beverages to thirsty millennials, their Saison registers a healthy – but nearly sessionable – 6% ABV. The brew pours a hazy light golden color and is capped by a thin, milky-white head. The nose is simple at first; an initial sniff yields just a hint of classic Belgian notes, but a deep, robust inhale reveals notes of apple, citrus and spice. These hints of flavor are immediately amplified with the first sip. Though I expected the traditional heavy breadiness of a Belgian, the initial flavor is surprisingly subtle. The flavor of bread is certainly present, but it’s balanced by a creamy malt characteristic reminiscent of a classic pilsner, all of which yields to a delectable combination of citrus and floral flavors as the beer washes across the palate. The finish is decidedly Belgian, though a resurgence of breadiness once again gives way to a hint of spice and the subtle sweetness of honey. Stone Saison is an interesting and wonderfully drinkable brew designed for the back porch, but strong and flavorful enough to be consumed all year long. Pick one up today, you won’t be disappointed! Check me out on Untappd for more of what I’m drinking!